Posted on Fri, Mar 16, 2012 : 8:48 a.m.
Luke Glendening, left, and Alex Guptill, right, received CCHA awards for best defensive forward and rookie of the year, respectively. The CCHA handed out its end-of-season awards on Thursday night at the Fox Theatre in Detroit and members of the Michigan hockey team, both young and old, were honored. Senior Luke Glendening was named the league's best defensive forward while freshman Alex Guptill received rookie of the year honors. 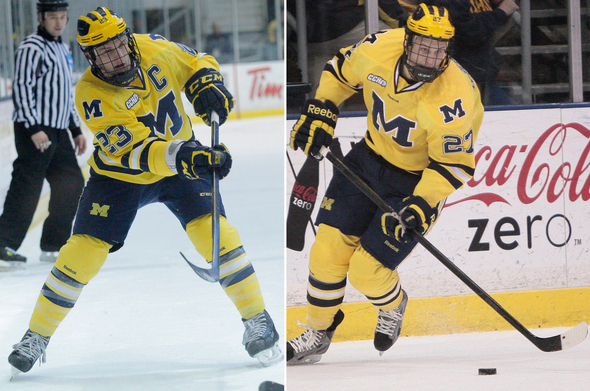 Coach Red Berenson, senior Greg Pateryn and Jeff Rohrkemper were finalists for coach of the year, best defensive defenseman and scholar-athlete of the year, respectively, but did not win. Glendening became the second Michigan captain in as many seasons to win the best defensive forward award after Carl Hagelin won it in 2011. Glendening is plus-15 on the year and has the most shots blocked (29) among forwards on the team. He has 18 points (9 goals, 9 assists) on the season. Guptill led Michigan and all CCHA rookies in scoring both overall (16 goals, 16 assists) and in league-play (13 goals, 12 assists). His totals tied him for the national lead among first-year players in goals while tying him for eighth in points. Though Michigan goaltender Shawn Hunwick was not up for any CCHA awards on Friday, he was recognized as one of the top players in college hockey. Hunwick was announced among 10 finalists for the Hobey Baker Award, college hockey's top individual honor. Another round of fan voting and review by a 23-member panel will determine the top three candidates, to be announced on March 29. The winner will be announced Friday, April 6 during the NCAA Frozen Four. Fri, Mar 16, 2012 : 2:21 p.m.
GONGSHOW GONNA GONG. I hate the CCHA. Hunwick for Hobey! Ready to rock Yost East this weekend, Michigan faithful?